Asymmetrical. If lesion were folded in half, the two sides would not match. Diameter greater than 6 mm (size of a pencil eraser). While melanomas are usually greater than 6 mm when diagnosed, they can be smaller. Basal Cell Carcinoma(BCC) The most common cancer in humans, BCC develops in more than 1 million people every year in the United States alone. About 80% of all skin cancers are BCC, a cancer that develops in the basal cells – skin cells located in the lowest layer of the epidermis. BCC can take several forms. It can appear as a shiny translucent or pearly nodule, a sore that continuously heals and then re-opens, a pink slightly elevated growth, reddish irritated patches of skin, or a waxy scar. Most BCCs appear on skin with a history of exposure to the sun, such as the face, ears, scalp, and upper trunk. These tumors tend to grow slowly and can take years to reach ½ inch in size. While these tumors very rarely metastasize (cancer spreads to other parts of the body), dermatologists encourage early diagnosis and treatment to prevent extensive damage to surrounding tissue. 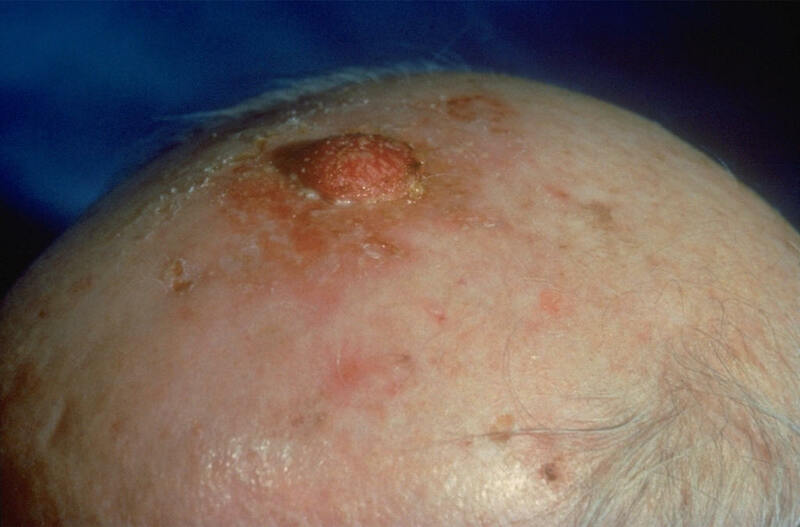 Squamous Cell Carcinoma (SCC) About 16% of diagnosed skin cancers are SCC. This cancer begins in the squamous cells, which are found in the upper layer of the epidermis. About 200,000 cases are diagnosed ever year. SCC tends to develop in fair-skinned, middle-aged and elderly people who have had long-term sun exposure. 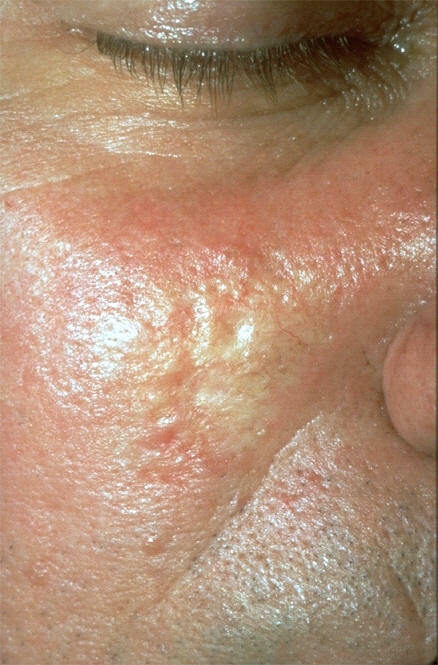 It most often appears as a crusted or scaly area of skin with a red, inflamed base that resembles a growing tumor, non-healing ulcer, or crusted-over patch of skin. While most commonly found on sun-exposed areas of the body, it can develop anywhere, including the inside of the mouth and the genitalia. SCC may arise from actinic keratoses, which are dry, scaly lesions that may be skin-colored, reddish-brown or yellowish-black. SCC requires early treatment to prevent metastasis (spreading). It is important to realize that a mole may have some of the characteristics described above and not be skin cancer. A biopsy is often necessary to distinguish an atypical mole from a cancerous mole. Sun exposure is the leading cause of skin cancer. According to the American Cancer Society, “Many of the more than 1 million skin cancers diagnosed each year could be prevented with protection from the sun’s rays.” Scientists now know that exposure to the sun’s ultraviolet (UV) rays damages DNA in the skin. The body can usually repair this damage before gene mutations occur and cancer develops. When a person’s body cannot repair the damaged DNA, which can occur with cumulative sun exposure, cancer develops. In some cases, skin cancer is an inherited condition. Between 5% and 10% of melanomas develop in people with a family history of melanoma. Print out our Body Mole Map to help you keep track of your moles!